I fell in love with this book when I first laid eyes on the cover(I know, I know. Don't judge a book by it's cover) but in this instance, the book lived up to it's stunning cover and beyond. Let me start with the characters. Brie was HILARIOUS. Her sarcastic humour and inability to give comebacks made the book a blast to read. Her kind, simple personality made it easy to love her. Being a hopeless romantic myself and my love for cheesy, sappy chick flicks, I instantly related to Brie. Her and I were close to the same person when I was 16. Patrick was another fantastic character. He met his match in Brie. Those two together made for many laugh out loud moments and many heart-warming ones as well. The Catastrophic History of You and Me had it's light moments but it also it's serious ones. And by that I mean, keep the tissue close by because you'll be sobbing like a baby. This book touches your heart and your soul. The character depth is so well crafted that you can't help but care for these characters. I can't forget to mention the twists and turns that were thrown into the mix. I was left completely jaw dropped. 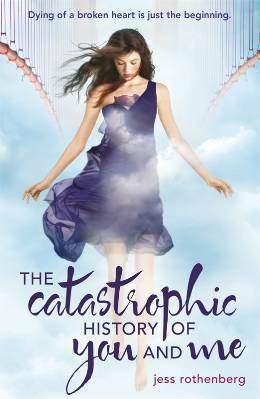 The Catastrophic History of You and Me was a beautiful story about love. About life after death. And about self discovery. I enjoyed every minute I spent reading this book. I love books with a funny main character. Too often I find YA books with girls how are self-conscious or quiet or depressed. Which is fine sometimes but every now and then you want a girl who can make you laugh!